Maxi Care Underpads with spunbond non-woven topsheet, diamond-embossed and polypropylene backsheet. 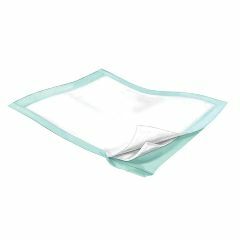 Extra large size and super absorbent lining with polymer sprovide maximum coverage, absorption, and protection on either chairs or beds. Used this product as wheelchair and bedding pad. Although they do provide surface protection, the lining of the pad seems to breakdown and clump into pieces leaving bare spots not to mention lumps. I thought I would try this product since the price was a little less than the pads I normally purchase. I don't plan on reordering. Very absorbent. Have used. Sturdy. Easy Storage. Safe. Lightweight. Elderly. Older dogs while I'm at w.
Use before for incontinent bedridden adult. Soft non-chafing to skin. Absorbent. Perfect size for hip to mid thigh and side to side match of hospital bed!! Now use as "target" pad for senior dogs while am at work! Wonderful! Saves yelling and frustration for all of us! !